The first fully integrated commercial site inspection platform combining a native ipad application and web-based project initiation and management portal. The web-based portal provides clients with an intuitive way to connect with consultants, as well as initiate and track projects. The at-a-glance dashboard immediately lets the user know the status of all inspections. 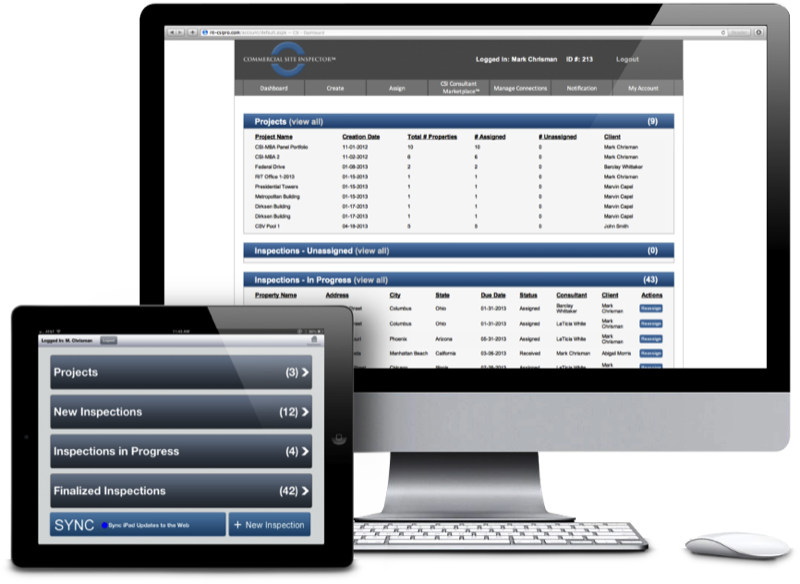 Designed to be extremely intuitive and user-friendly, the web-based portal is the gateway to more efficient, higher quality inspections. Throw away the pencil, notepad, and digital camera. An iPad and the Commercial Site Inspector app are all a consultant needs to initiate, receive, and complete inspections. Clients (services, lenders, loan originators, rating agencies, etc.) can connect with field consultants and inspection intermediaries to ultimately deliver inspections directly to the consultant's iPad. Clients have gotten very used to receiving paper or electronically transmitted files that are manually transcribed upon receipt. The CSI platform was developed to eliminate the cost and potential error included in that process by providing InfoConnect - an electronic bridge essentially carrying data from the consultants fingertips in the field to the clients platform.